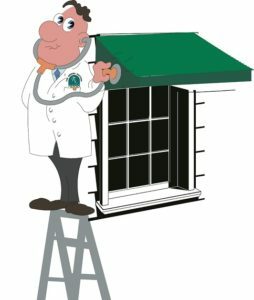 Awning Doctors has provided the specialized service of Awning Repair to the greater Tucson area for over 30 years. We repair many types of awnings. There are many types of needed repairs for awnings. If you have an existing awning that needs attention, we are happy to provide you a free cost estimate. Our quotes are always free of charge (in the greater Tucson area). Some of the most common repair work we get is directly related to the condition of the fabric. Our objective is to extend the look, life and functionality of your awning. If a repair can be done, we will always suggest this first before suggesting a replacement or recover, as it is typically a less expensive cost for you. If you do not see the kind of repair you feel is needed in the list above, please contact us to ask how we can help.